Supposed's Club Penguin Cheats & Secrets | Find everything for Club Penguin cheats. Ever wanted to chatted with the famous GWA? Well here you can! Just wanna let you know that you’re all gonna see more updates on here, which means more posting, new looks, and much more! Stick around and you can win some amazing things, do some amazing things, and etc etc etc! New Club Penguin Music Video – Coming Soon! Just wanna let you all know that my new Club Penguin Music Video is finally done – but not here yet. A lot is going to happen within the next couple months. Once the new video comes out I’ll explain more, but just remember – GWA is back! & also, new updates to the site should also be coming soon. Shortly after the new video is posted. Hey everyone, a new video is coming soon – so don’t worry! But don’t sweat it because I’m not leaving this site for good. There is going to be a whole new design and everything… soon! Now the summer is here, so I have plenty of time on my hands. So stay tuned for a new video, a whole new website, and much more. New Club Penguin Music Video – GWA Is Back! Hey all, I know I haven’t been on in A LONG time. But I just want you all to know that GWA is back with me and Wwe Adam! I hope you like! CLICK HERE to comment, rate, favorite, etc. Thanks guys! Hope to see you all soon! Here are the Club Penguin cheats for the halloween party of 08! 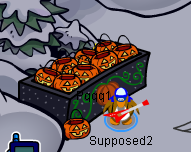 NOTE: In order to do the scavanger hunt, you need your pumpkin basket! Candy 1: Go to the snowforts, and click the blue flag. Candy 2: Go to the dancing lounge and click the lamp. Candy 3: Go to the lodge attic, and click the blue box next to the 3 candles. Candy 4: Go to the plaza, and click the yucky stuff in the icky green pot of GOO! Candy 5: Go to the cove and click the warning sign down by the rocks. Candy 6: Go to the ice burg, and click the green lights in the sky. Candy 7: Go to the beacon, click the sky 3 times (make sure it thunders), then it should fall down in the large pumpkin. Candy 8: Go to the book room, then on top of the books you’ll find the last piece! And your prize is a background. To get to the secret room, go to the bookroom and click on the green candle on the bookshelf. There is also a free item in there as well! Just to inform you on how I’m back on Club Penguin! I’ll try to update as much as I can, and post videos as much as possible, which would probably only be once a month. I’m back because I felt that I shouldn’t just leave all my hard work to sit in dust. Even though I barely have time for any of this, I’m still going to try and keep up as much as possible. So anyways, I’m single in video wise, which means no group for awhile. Okay so basically Wwe Adam was admin on my site, then he added Jc4x4 who hacked it. Then gave the site to red rod who thought he had my permission to have the site when I had nothing to do about it.